Located on 1,353 square miles within California’s southern Sierra Nevada mountain range region, Sequoia and Kings Canyon National Parks preserve a densely-forested region containing notable sequoia trees and natural landmarks and offer a variety of visitor experiences, including lodges, restaurants, visitor centers and museums, and outdoor activities. Sequoia National Park was the second national park created in the United States, established with legislation signed in September of 1890 by President Benjamin Harrison and designed to protect the giant sequoia trees of the Sierra Nevada range from devastation by the logging industry. Troops of the United States Cavalry Army oversaw protection of the park between 1891 and 1913, when the park’s first civilian administrator was appointed. Three years later, the park was transferred to the care of the National Park Service after its creation. Though early access to the park was only available through primitive roads, the construction of the Generals Highway in 1926 made the park accessible to a wider visitorship, and a number of backcountry trails and visitor amenities were created within the park in the following decades. In 1940, Kings Canyon National Park was created by legislation signed by President Franklin D. Roosevelt, and the nearby General Grant National Park was folded into the new park’s territory. The park was designated to preserve the Kings Canyon region of the Sierra Nevada mountain range, which includes some of the steepest vertical relief in North America, with peaks reaching a height of 14,000 feet in some areas. Following World War II, administration of Sequoia National Park and Kings Canyon National Park were designated to be administered jointly by the National Park Service. Today, Sequoia and Kings Canyon National Parks encompass more than 1,353 square miles within California’s southern Sierra Nevada region, with more than 97% of the parks maintained as designated wilderness areas. 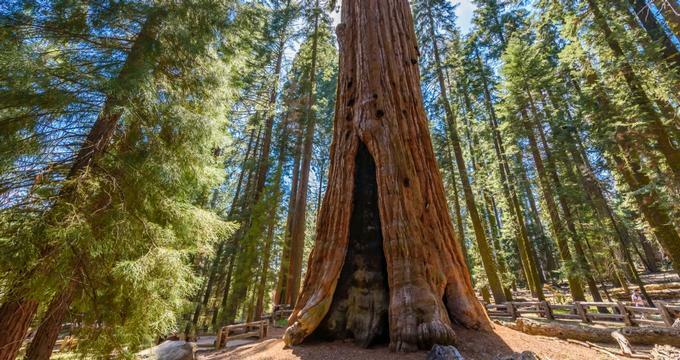 More than 1.5 million visitors attend the joint parks every year, which are located near California’s San Joaquin Valley and strive to protect the region’s historic sequoia trees and other natural features for generations to come. The park’s elevation ranges from heights of 1,370 feet to 14,494 feet, and its landscape varies between mountainous areas, undeveloped foothills, canyons, caverns, and forest regions. Notable natural features within the park include the General Sherman Tree, the largest-known tree in the world which stands at a height of over 275 feet tall. The parks are also home to the underground Crystal Cave, which features notable rock formations, the granite Moro Rock dome, which offers panoramic views of the surrounding natural areas, and the Tunnel Tree, a toppled great sequoia tree carved to accommodate a visitor road. Five visitor centers and museums are offered throughout the park, including the Foothills Visitor Center, which is located within the park’s Foothills visitor unit near the Kaweah River. Outdoor exhibits are featured, along with trailheads for a variety of hiking trails through the region’s biologically diverse natural features. Within the Giant Forest unit of the park, which is home to some of the region’s finest examples of giant sequoia trees, the Giant Forest Museum offers a variety of year-round museum exhibits. Several hiking trails are also offered within the unit, including the Big Trees Trail and the Moro Rock-Crescent Meadow Road. The Lodgepole Visitor Center, located within the wildlife-heavy Lodgepole unit, offers daily showings of the orientation film Bears of the Sierra. The Grant Grove unit of the park, which encompasses the former territory of General Grant National Park, offers a variety of day hiking opportunities, including the Grant Tree Trail and the scenic Panoramic Point Trail. The unit’s Kings Canyon Visitor Center offers a bookstore and film showings, while the nearby Grant Grove Stables hosts guided horseback riding expeditions. The Cedar Grove unit is home to prominent rock formations such as the North Dome and Grand Sentinel and offers visitor amenities at its Cedar Grove Visitor Center. A Mineral King Ranger Station within the park’s Mineral King area also houses museum exhibits related to the region’s natural and cultural history. A variety of overnight accommodations are offered throughout the park, including the Wuksachi, Cedar Grove, and John Muir Lodges and the Grant Grove Cabins. Wilderness lodging is offered at Bearpaw High Sierra Camp and Pear Lake Winter Hut, while 14 campgrounds are available on a first-come first-served basis, including three year-round campground facilities. A number of food options are available throughout the park, including the Grant Grove and Peaks Restaurants, the Lodgepole Deli and Market, and the Cedar Grove Snack Bar. Dining options are also offered at several lodges near the park, and picnic areas are provided throughout the park’s units. Outdoor activities offered throughout the park include day hiking, backpacking, rock climbing, skiing, snowshoeing, and horseback riding, with many outdoor excursions led by park rangers and offered as daily park programming. A Junior Ranger program allows young visitors to receive participation badges in exchange for completion of park activities, and a number of educational opportunities are offered by the parks, including curriculum-incorporated field trips and in-classroom distance learning programs.